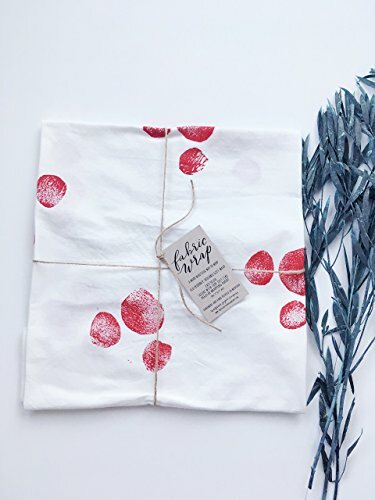 GIFT WRAP, Fabric Wrap™, Red Dots, eco friendly reusable, holiday, present, natural, rustic, farmhouse, cottage Active by Sweetgrass Paper Company at Nicky's Blog. Hurry! Limited time offer. Offer valid only while supplies last. Fabric WrapTM A more beautiful way to wrap! Eco friendly, reusable fabric gift wrap. Easy to use! Secure with tape just like regular wrapping paper. Fabric WrapTM A more beautiful way to wrap! Eco friendly, reusable fabric gift wrap. Easy to use! Secure with tape just like regular wrapping paper. Each piece handmade and hand printed in Montana One 29"x23" sheet Our story: One Christmas we were horrified to discover that we had two huge bags full of trashed wrapping paper after everyone was done opening presents. We set out to find a better way to wrap presents beautifully without creating so much waste. We wanted something easy to use, easy to reuse, and affordable! After much experimenting, Fabric Wrap was born. You can wrap it with tape just like you would use regular wrapping paper, and it can be used over and over again, not to mention, it makes your presents look absolutely beautiful! Each piece is hand printed for a rustic look, thus variations will occur, making each piece a unique work of art. Accessories not included. Copyright Sweetgrass Paper Company, 2016: All images, designs, and text are copyrighted and cannot be stored, reproduced, or used without obtaining prior written consent from the owner. If you have any questions about this product by Sweetgrass Paper Company, contact us by completing and submitting the form below. If you are looking for a specif part number, please include it with your message.